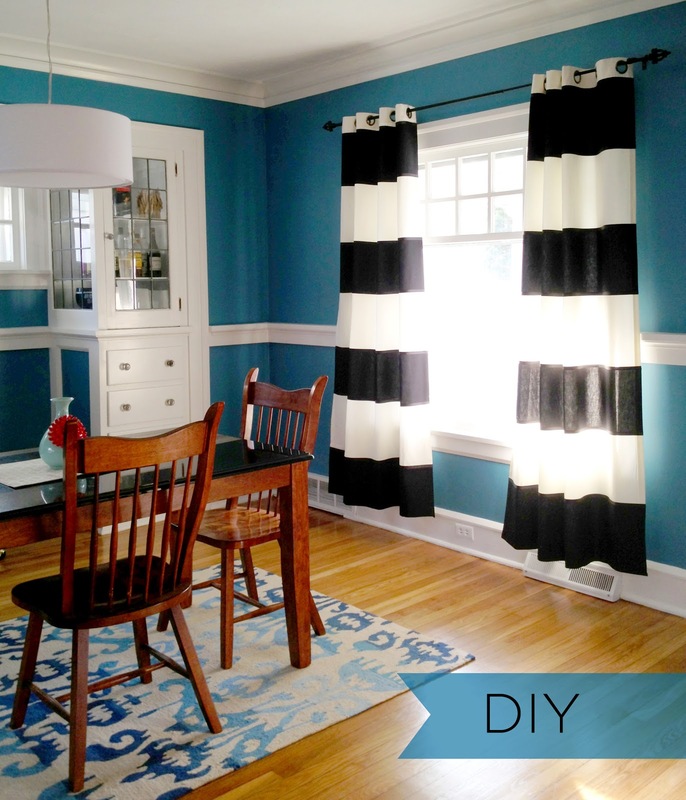 As I mentioned in my DIY Ombre Curtains post — window coverings can get pretty pricey. What's even more frustrating is when you just can't find what you want out there in the market. I had a vision for striped curtains, but they had to be BOLD — the bigger the stripes, the better. I couldn't find them anywhere, until my old friend Pinterest led me to this post with instructions on how to make exactly what I wanted. This was strikingly easy, but took some time. 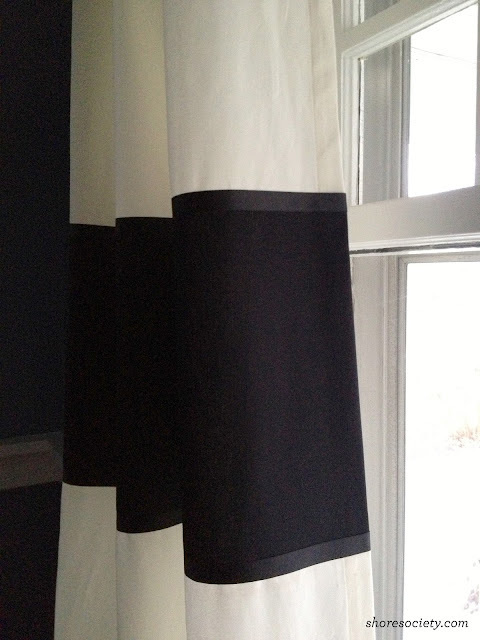 I also made four panels, since we used these on our living room window and our dining room window. They are the two windows in the front of the house, and we felt they had to match. 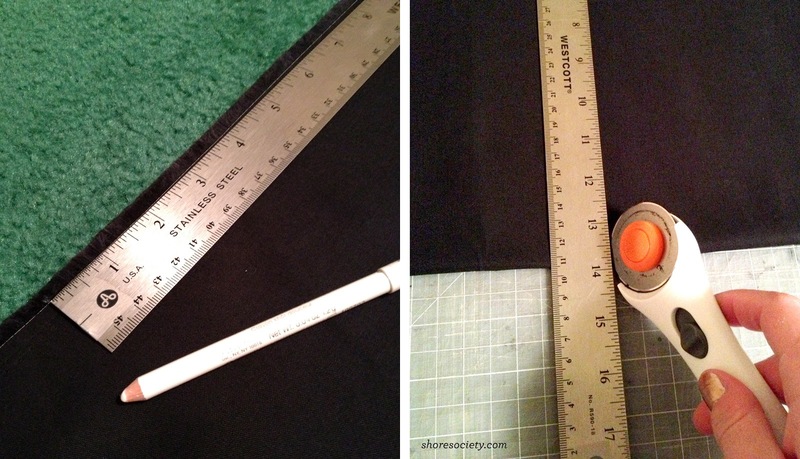 Start by cutting your strips of black fabric. Depending on the size of your drapes, you'll want to do some math to figure out how long the stripes need to be. 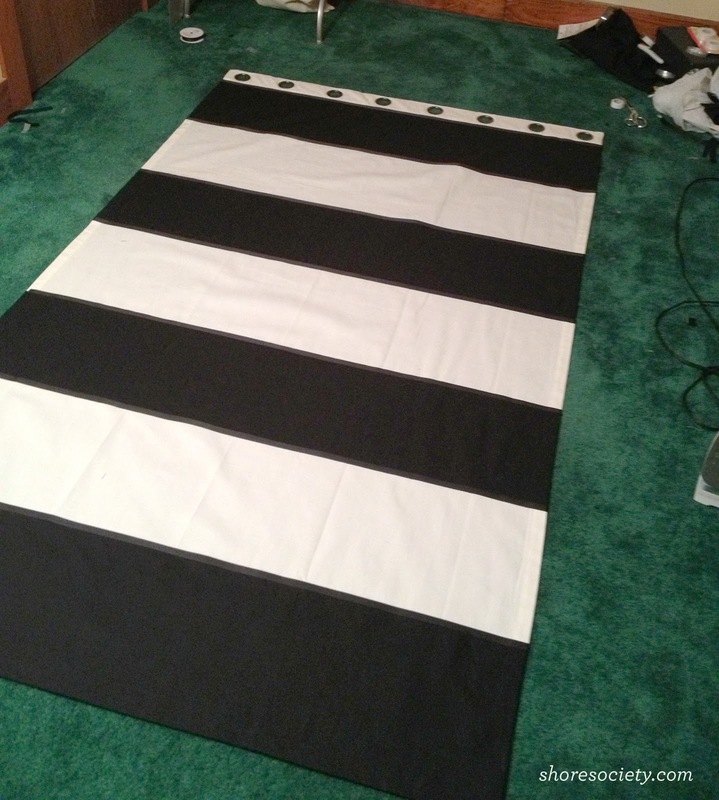 Mine were 84" long, and I wanted 4 black stripes, so I subtracted the grommet tab from the total length, then divided that by 7 (total stripes). Phew - this is boggling my math-inept brain. Each stripe ended up being 11". The length will be the same for all of the stripes except for the bottom one — it will have to be a couple inches longer, so it can be folded under for a finished look. For the rest, you will just leave the edges raw. As for the width, you'll want to add at least an inch on each side, so they can also be folded around and secured on the back of the panel. Disclaimer: this is our fugly attic carpet. But hey...we have a finished attic at least, right? Lay your curtain panel out and place your stripes down, measure the spaces to make sure they're even, and get to ironing. Use a strip of Stitch Witchery at the edges of each stripe, and iron carefully to adhere the stripes to the panel. Don't worry about folding the raw edges over to create a seam - you'll just cover the raw edge with grosgrain ribbon, also attached with the Stitch Witchery. Once you're finished attaching the stripes and ribbon, flip the panel to the other side, and fold extra stripe fabric over and secure with more iron-on adhesive. Also do this with the ribbon - it will give you a seamless, finished edge. Here's a good shot of how the edges should look. Repeat for the second panel, and you're done! Each panel took me about two hours, but by the time I was on my fourth I flew through it. I'm so happy with the process and how bold they look in our house. Our dining room totally pops, and the stripes also compliment the cozy neutral scheme we have in our living room. They work perfectly in both spaces. Now that I've got a whole bag full of Stitch Witchery, I'm looking for more projects like this. If you have any ideas, send them my way! These look great! They really complement the room. Those drapes are BEAUTIFUL. Awesome, awesome DIY!